Inspired by Amma’s life and fascinated by the Universal Love and Compassion which she radiates, disciples of Amma come from all over the world to stay with her and live in her ashram. Some come and stay for a short period. 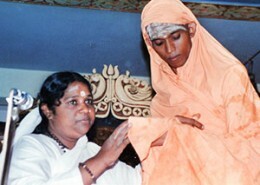 But there are quite a few of them who have decided to stay with Amma for the rest of their lives. They come from all walks of life — engineers, doctors, nurses, businessmen, carpenters, artists —most of them are young, some of them have become old. These celibate disciples who have given up the pleasures of a material lifestyle and who are engaged in the life long discipline of putting Amma’s teachings into practice in their own lives are called brahmacharis. ‘Brahmachari’ means one who abides in Brahman (the Absolute Reality), or one who lives for realising Brahman. 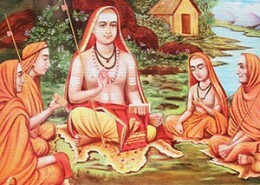 The brahmacharis are also taught to chant Vedic mantras in the traditional manner. Eminent Sannyasis from other ashrams and reputed scholars also conduct classes for the benefit of the ashram residents. The ashram residents are also taught to do ritual worship like pujas and homas. The spiritual and material benefits accruing from the performance of these rituals are also explained in depth in these classes. After learning the theoretical aspects in class, the brahmacharis conduct homas and pujas. The brahmacharis give classes for devotees at various ashram centers, conduct regular value education spiritual camps for kids, youth and adults at various centers and schools. The claases vary from Gita, Management techniques, Cultivating values, Teaching Meditation and Yoga according to the need and capacity.